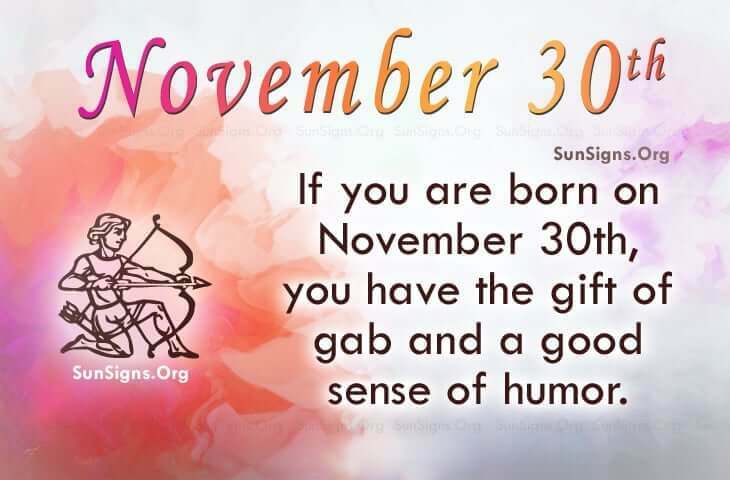 Famous people born on NOVEMBER 30 are undoubtedly Sagittarius who have a good sense of humor. They can make people laugh for hours on end. They can talk about anything and make it funny and interesting. They also have a great ear for listening. Famous November 30 celebrities are optimistic individuals as well. As someone who loves to travel, they don’t like being bothered by time issues that restrict and bind them. They also consider this when they are in a romantic relationship. They love with all their heart but when it comes to being tied down, their significant other may have to think twice. They like to be able to do things on the spur of the moment with their partner, friends and family. Those of them who were born on this day are likely to be very talented. These are awesome birthday traits to have when someone is down and out. Even their hobbies could be a lucrative career if they so choose. With their communication skills, famous people born on November 30 make terrific sales people. The possibility of earning a decent living is there if only they learned to save more than they spend. Famous people born on NOVEMBER 30th have the gift of gab when it comes to sales. They know how to turn an idea into an opportunity. They love to be tested or challenged. Being the adventurer, they love to discover new places or hidden places. Getting to know this Sagittarius can be somewhat difficult as they may have trust issues.